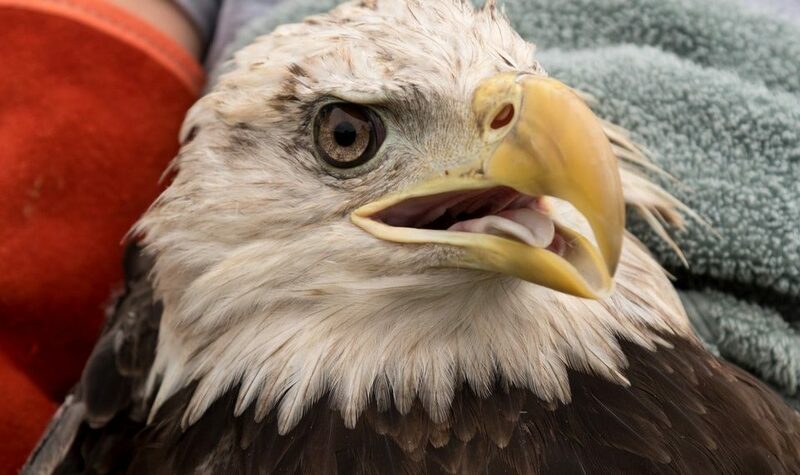 After showing signs of improvement several weeks ago, “Lily,” an American bald eagle that was rescued from a tree in Alexandria after being shot in the leg, has suffered more health setbacks, caretakers said. When Lily was first brought to The Raptor Trust, the Millington facility rehabilitating the eagle, caretakers were cautiously optimistic that the bird would one day recover, but he was in pretty bad shape. In addition to dehydration, the bird also had blood in it’s mouth and it’s broken, dangling leg was still bleeding. Wildlife experts took the bird for X-rays and emergency surgery and found that he had been shot. In recent months, he’s suffered repeated setbacks, specifically as a result of high levels of lead in his blood, according to Chris Soucy of The Raptor Trust. Soucy said the only explanation for the high levels of lead is that “small fragments of lead from his gunshot wound to be leaching into his system.” When Lily was shot, it’s possible that the fragments became embedded in or near bone. The eagle has undergone numerous rounds of treatments to flush some of the led from its system, but caretakers can’t continue the treatments on a long-term basis without harming the bird. “We will try one more round of treatment for the lead poisoning, but if this continues to happen, we cannot repeat the lead treatment indefinitely – that would eventually overload the bird’s renal system and lead to failure,” Soucy said on Facebook. “We are continuing treatment for the time being, and we are trying to remain positive. However, these current setbacks do not leave us optimistic,” Soucy said. As caretakers continue working to rehabilitate the bald eagle, investigators are continuing to search for the person who shot the bird. In January, Soucy said an $8,000 reward for information leading to the person who shot Lily with a pellet gun in early December. The reward is being sponsored through a partnership between the U.S. Department of Fish and Wildlife, the U.S. Humane Society and Crimestoppers of Hunterdon County. Soucy said anyone with information on who may have shot Lily can contact the Operation Game Thief hotline at 1-855-OGT-TIPS.